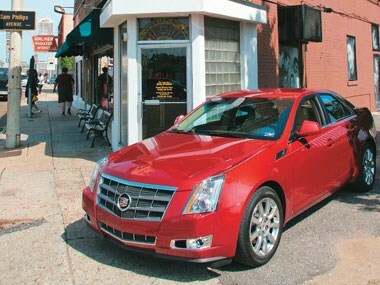 Going to Graceland: Cadillac CTS to Memphis. 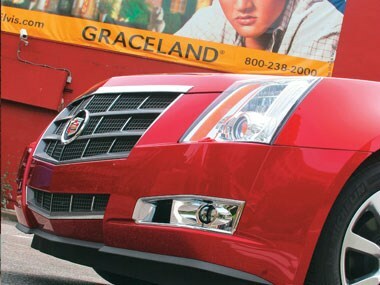 Would Elvis Presley, who bought over 200 Cadillacs in his life, have driven a new CTS? We drive one to Graceland to find out. [Jun 2008] Elvis loved his Caddys. Legend has it that he bought over 200 in his lifetime. From the year-old pink and white Eldorado he got in 1955, to the two-tone burgundy and silver Seville he had delivered just weeks before he died in August 1977. Most of them he simply gave away to friends and anyone who helped him out: his karate instructor, his bodyguard, the guy who coiffed his hair. The first thing he did when the money started rolling in was buy a massive '55 Fleetwood for his mum Gladys. It didn't matter that she couldn't drive. One day in July 1973, he supposedly walked into Madison Cadillac, his local dealer, and spent over $200,000 on 29 new Caddys, for his mates. A year later, he bought 14 in the same day, giving one to a complete stranger, a bank teller called Mennie Person who was admiring Elvis' custom Cadillac limo parked outside. Now, 31 years after his death, there's a brand new Cadillac in the showroom. It's faster, better-handling, better-built than any of his previous cars. So we pose the question: if Elvis were alive today, and no doubt still playing farewell concerts in Vegas at the ripe old age of 73, would he have gone out and bought a new Cadillac CTS? 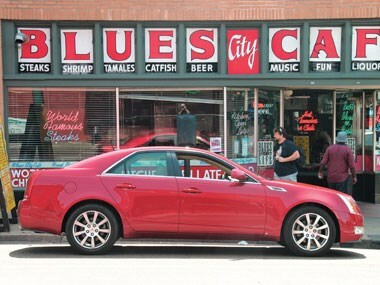 To find out, we drove a CTS to Memphis, Tennessee, birthplace of the blues, and home to Elvis and his beloved Graceland mansion. You've probably heard all about this new BMW 5 Series-sized Caddy. It's the car that will mark Cadillac's return to Australia after an almost 40-year absence when it goes on sale Down Under later this year, priced at around $70,000. In the metal, it's a stunner. With its massive, in-your-face egg crate grille, Stealth-fighter bodywork and big, blistered wheelarches, it looks like it's doing 160-kays standing still. Power comes from a 227kW 3.6-litre V6 with advanced direct-injection, mated to a fast-shifting six-speed automatic. Memphis is part of America's Deep South. The city of 670,000 people sits on a high bluff overlooking the languid, mocha-brown Mississippi River. And like the river, the city ambles at a laid-back pace. Nothing moves too fast here; old-style rail cars clatter down the main street; horse and buggies take tourists for a slow meander past the landmarks. But Memphis is rhythm and blues ground zero. Some of the world's blues greats grew up here and performed their music in the halls and bars on Beale Street; Muddy Waters, Howlin' Wolf, Robert Johnson. BB King still has a bar here and is a regular at the microphone. Elvis moved to Memphis from nearby Tupelo, back in 1948 so that his dad Vernon could find work. The family was dirt-poor and lived in a run-down apartment building in a run-down part of town. His only escape was his guitar. Elvis' world changed on July 18, 1953 when he walked through the door of Sun Records' Memphis Recording Service to pay $3.98 to cut a disc as a belated birthday present for his mum. While fooling around between recordings, he started singing a version of Arthur Crudip's That's All Right (Mama) and the rest is history. Sun Studio has hardly changed since Elvis hung out here in the '50s. The redbrick building with its giant Gibson guitar hanging outside on the wall, takes up a corner of Union Avenue. We park the Cadillac and take the $10 tour. It's money well spent. Here in this tiny set of rooms, the likes of Johnny Cash, Roy Orbison, Jerry Lee Lewis and Carl Perkins played their hearts out. And the first ever rock 'n roll record, Rocket 88 by Jackie Brenston, was cut right here. Elvis' microphone is there in the corner of the room, while Jerry Lee's upright piano is pushed up against a wall. With the scratchy, original cut of That's All Right still ringing in our ears we point the Cadillac's nose towards downtown Memphis. We cruise past the Baptist Memorial Hospital, big, blocky and faceless, where Elvis was pronounced dead in Trauma Room number one on August 16, 1977. Then, it's across to Beale Street, home of the blues, now a slightly seedy, run-down party hangout that ranks up with Bourbon Street in New Orleans as a 'get 'em drunk' tourist trap. But we're told that on the weekend the place still rocks with authentic R&B till the early hours. Elvis used to love this place. The Cadillac's sat nav system develops a mind of its own, diverting us on to the fast-flowing I-55 interstate as a shortcut to Graceland rather than the more direct Bellevue Boulevard. 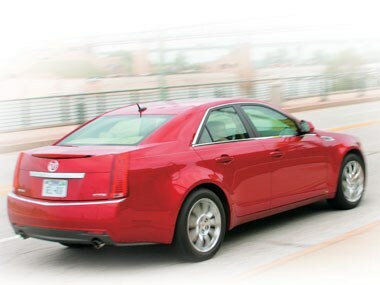 But it gives us a chance to stretch the CTS's legs and feel its grip and balance through some of the tight entrance ramps. This is arguably the most dynamic, most agile Cadillac ever built. Its rear-wheel drive Sigma platform has really benefited from thousands of development hours hammering around the Nurburgring. Through the curves, there's minimum body roll and masses of grip. And with pizza-sized discs at each corner, it stops as well as it goes. And its direct-injected V6 punches it nicely from standstill-to-100 kays in a hair over 6.0secs and doesn't quit till the computer calls 'game over' at 240km/h. 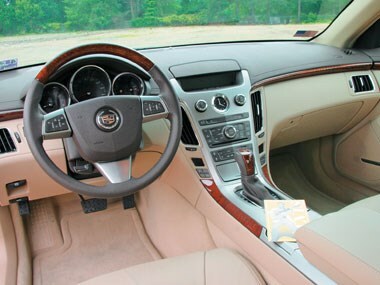 But where the CTS really stands out is in its interior. While Elvis liked his Caddys' cabins to be a boudoir of white-buttoned velvet, shag-pile and 24-carat gold plate, the CTS is all Euro-sleek, with double-stitched leather, chrome-ringed gauges, and Audi levels of fit and finish. Off the Interstate and on to side roads running through rundown, super-poor neighbourhoods we finally see the sign in the distance for Elvis Presley Boulevard. As you approach Graceland, it's not the mansion you see first, more the towering tail of a Convair 880 jet parked at the side of the road. 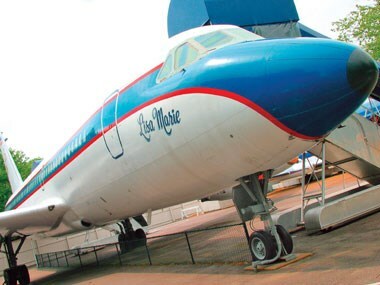 This was Elvis' plane, with its distinctive TCB and lightning strike logo on the tail - short for Taking Care of Business… in a Flash - and the name Lisa Marie, after his daughter, painted on the pointy nose. The house, with its white Colonial columns at the front, is elegant, restrained, and surprisingly small by today's A-list celebrity standards. Elvis bought it in 1957 from a local doctor - the estate was named after his wife Grace - and never wanted to move. He's buried alongside his parents in the Meditation Gardens in the grounds. 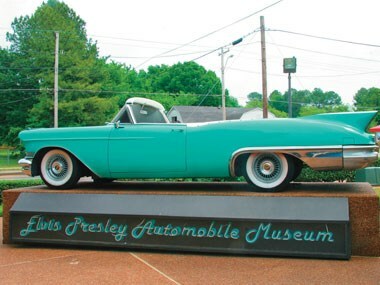 Across the street from the house is Elvis' must-see car collection, or at least part of it. As The King kept few of his cars, most of the 33 vehicles on display were rounded-up after his death. Amazingly, only three are Cadillacs, with the most important being the one he never sold. This was the pink and white '55 Fleetwood 60 Special he bought for his mum Gladys. The car was originally painted blue, but Elvis wanted it painted pink, so a neighbour who ran a paint shop, mixed the colour and called it 'Elvis Rose'. Not all of Elvis' cars were big saloons. Also on display in the museum is the black 1975 Ferrari 308 GT4 with chrome wire wheels that Elvis bought second-hand in 1976. There's also the cute, bright red 1960 MGA that Elvis drove in his movie Blue Hawaii. He liked the car so much, he bought it, but eventually gave it to his secretary. Elvis also developed a soft spot for custom-made Stutz Blackhawks - he bought five between 1971 and 1974. There are two of them on show at the Graceland museum. The black 1971 car was the very first Blackhawk delivered, but it's the 1973 car that's the more interesting as this was the last car Elvis ever drove - he took it when he went to his dentist on August 15, 1977, the day before he died. In typical Elvis fashion, it has bright red leather and is edged with 18-carat gold trim. In addition to Cadillacs, Elvis bought a lot of Lincolns. The 1962 Continental on display was one he bought in Las Vegas and features a gold alligator-skin padded roof. It sits next to a 1966 Rolls-Royce Silver Cloud III that was later owned by Little House on the Prairie actor Michael Landon, and country music star Charlie Rich. As we drive away, feeling the CTS' strong surge of acceleration and the crisp shift of its six-speed auto, you instinctively know that Elvis would have had one parked outside the front door of Graceland. Maybe it would have been 'pimped' a little - gold plate instead of chrome, Bose stereo, 22inch rims. 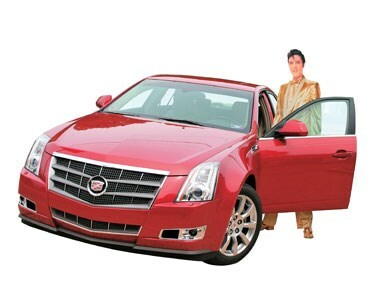 But most definitely, Elvis would have loved the CTS. 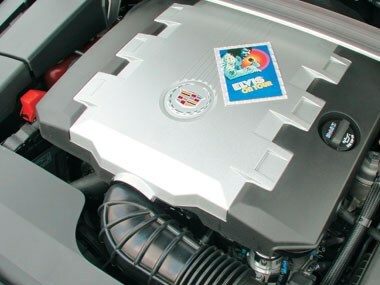 More than likely, he'd be angling to get the first supercharged, 410kW, 6.1-litre 2009 CTS-V. You can do that when you're The King.